Orion Variable Polarizing Filter 2"
The Moon is one of the most enticing targets to view in the night sky. Thanks to its big, bright appearance and intriguing landscape features, the Moon is a favored sight by amateur astronomers all over the world. The Moon is in fact so bright with reflected sunlight, especially during a Full Moon, that it can overwhelm astronomers with distracting and view-degrading glare. The specialized 2" Orion Variable Polarizing Filter for 2" telescope eyepieces provides an elegant solution by toning down the brightness of the lunar surface so you can enjoy optimized contrast in each and every view of our nearest neighbor in the solar system. This versatile 2" Orion Variable Polarizing Filter acts like a dimmer switch for your 2" telescope eyepiece, toning down the brightness of the Moon and even planets to a comfortable level. Not only does this dimming provide a more comfortable view, it also helps to enhance contrast of interesting lunar features such as mare (or "seas"), mountains, valleys, and of course all those stunning craters. Reducing the overall brightness of the Moon helps reveal more surface details so you get the most out of each view. The 2" Orion Variable Polarizing filter consists of two high-grade glass polarizing filters securely held in a rotating telescope eyepiece filter cell that allows you to vary the amount of light transmission over a wide range from 1% to 40%. Such control is highly desirable for lunar observing because the Moon's brightness varies with its phase and with the aperture and magnification of the telescope you are using. For example, to view the Full Moon with any degree of clarity would require a significant amount of dimming, closer to the 1% transmission limit. On the other hand, when the Moon is a thin, waning crescent in the night sky, you'll get the best results with minimal darkening, closer to 40% transmission. 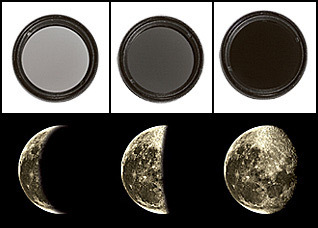 The Variable Polarizing Filter won't change the Moon's natural color, so your views will simply be optimized, not altogether altered. The anodized aluminum eyepiece filter cell threads into the barrel of any Orion 2" telescope eyepiece, and fits most other brands of telescope eyepieces too. Includes a durable plastic storage case. Get the 2" Orion Variable Polarizing Filter today and see fine surface details of any phase of the Moon like never before!